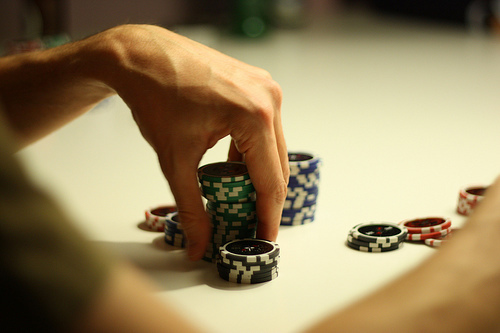 If you’ve played your share of poker you’ve undoubtedly crossed paths with the online bully. He’s the one raising every pot at the low limit live games often by ten times the big blind or more. It doesn’t stop there either… the flop and turn also bring double or triple the pot-size bets, even when he holds nothing more than a queen high. Happily, there is a solid strategy for the disciplined that should have you inviting the bully to your table rather than fearing him. The bully employs large bets to encourage players to fold middle or bottom pair… marginal hands really. Also, over time this seems to convince players to play with weaker starting hand, hoping to catch lucky and get paid off… or even worse to move all in with marginal holdings. Don’t fall into his trap! The first step to defeating the bully is to understand his strategy. We note that the average player buys in to a no-limit Texas Hold’em game with about 50-100 times the big blind in chips. By raising 10 times the big blind preflop and following up with overbets on the flop and turn, the bully has put his opponent to a decision for all of his chips before the river card comes down. Take into effect that any unpaired hole cards have about a 1 in 3 chance to connect with a pair on the flop… meaning 66% of the time the bully will bet when you haven’t even managed to hit a pair. Then, even if you’ve managed to hit the flop the majority of the time it will be second or bottom pair… not exactly a hand most people are comfortable committing their entire stack to. This strategy becomes profitable after the other players have loosened up against the bully, calling him down with ace high or, re-raising all in preflop when they have good hands. Ultimately, the bully hasn’t had to make any tough decisions. His seemingly insane bets are producing their weight in gold of information about his opponent’s holdings. You need to be patient and you need to keep a clear plan of playing strong cards. First off, be sure you’re starting with the proper hands. While’s he’s picking up the blinds with his J5 offsuit, there’s absolutely no reason to confront him with your K7. You want to minimize luck as best you can. Of course, you can’t wait for pocket aces every time and you may need to play a little looser than usual… but make sure you stick to middle to high suited connecters, suited aces(an ace with any other card of the same suit), face cards and middle pairs or better. Secondly, Call. Call. Call. This is one of the few situations in which I’d counsel you to call more than you raise. Calling gives less information about your hand and if you raise with the goods, the bully might make an easy fold rather than betting into you on the next street. Allow him to trap himself, as a raise will sometimes scare him off and calling often won’t. Be sure to protect pairs on the flop that might get outdrawn, or 4 card flush draws with all in raises. Lastly, you shouldn’t bluff the bully… at least not yet. He, perhaps more than anyone, needs to be shown you’re only playing with strong hands and it may take some time to earn his respect. When he starts checking the river even though he has a pair, you’ll know he’s keyed in on you as a tight, solid player. After you’ve acquired this image, you can check-raise fourth street on some pots. Follow these simple guidelines and you’ll be well on your way to conquering the online bully… and now that you’ve learned a few of his tricks, maybe you’ll want to try them out for yourself! Escape the Rat Race for a While with Party Casino!